I got my first Open Badge at Mozfest 2013, and was delighted by the opportunity to have sweet little dinosaurs linked to me. At Brighton Katie Piatt and Emma Illingsworth had run a small pilot which combined badges and gamification to encourage a more enaging library induction, which proved successful but the awards weren’t transferable. 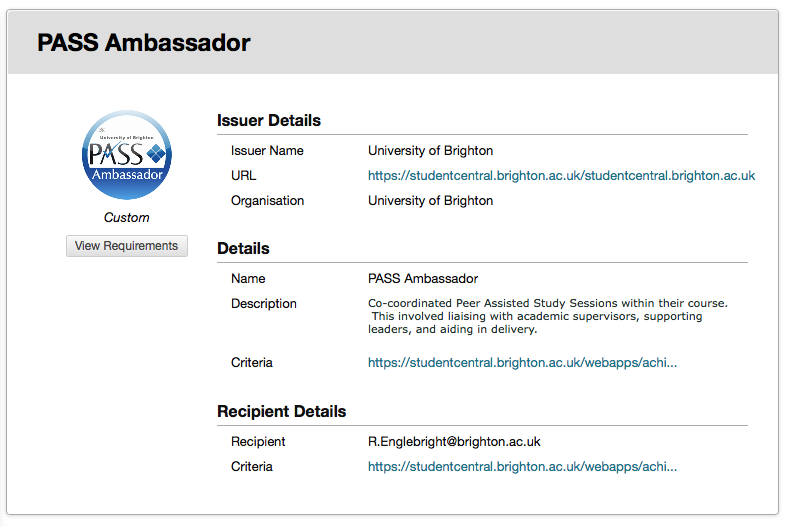 Encouraged by The University of Southampton who shared their experience awarding badges for Student Digital Champions , we outlined a trial which would use Open Badges to reward non-curriculum activity, curriculum activity already rewarded through module credits. 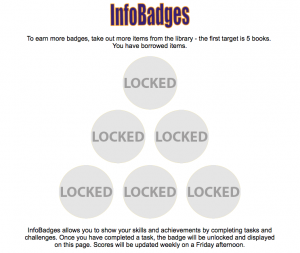 Badges would be unlocked for activities already completed by the students, based on what has been done not a value judgment on how well it was done. 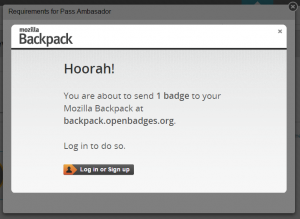 Mozilla were promoting their Open Badge infrastructure, and their “back-pack” had emerged as the defacto solution for surfacing badges issued elsewhere. 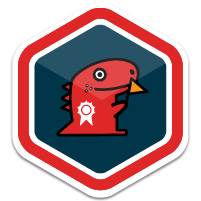 The Mozilla hosted badge issuing server solution “badgekit” was available as a closed beta, with indications that the service would be opened in October 2014. The code base was available on Github in two components which ran on a Node.js server, and was available as a development tool in the form of a Vagrant VM. and publish to Mozilla- yes/no. 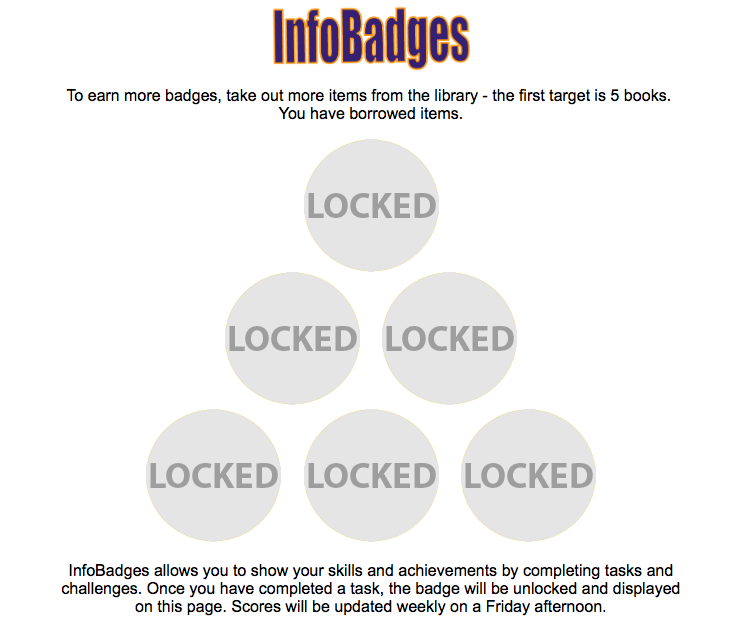 The My Achivements tool shows only badges generated within Blackboard, though BB generated badges can be displayed in Mozilla Backpack IF the user email registered in Blackboard is the same as that registered with the Mozilla Backpack. 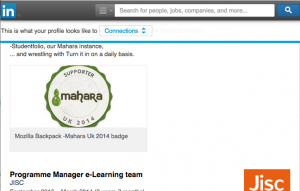 Critically for our trial was the ability to surface the badges in the users mahara portfolio – studentfolio. This was possible, but required some hoop jumping that seemed out of proprtion to the reward. The user has to gain the Achievement in Blackboard, publish it to a Mozilla Backpack using the same email address, then surface it in Mozilla using the open badge displayer plugin. 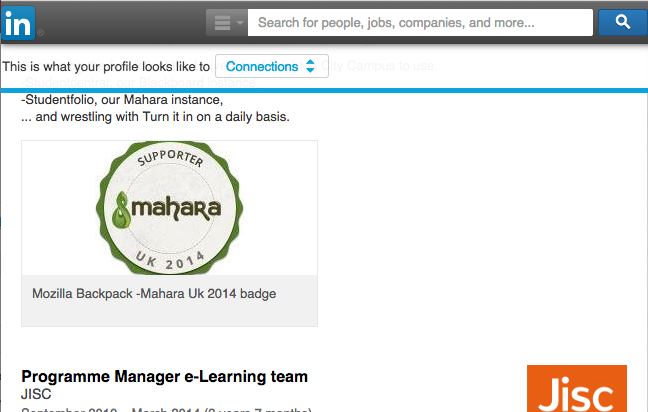 Alternatively the badges can be added to a public collection which can can been shown in the mahara portfolio by emedding a link in an iFrame, this method is supported in the mahara docs. 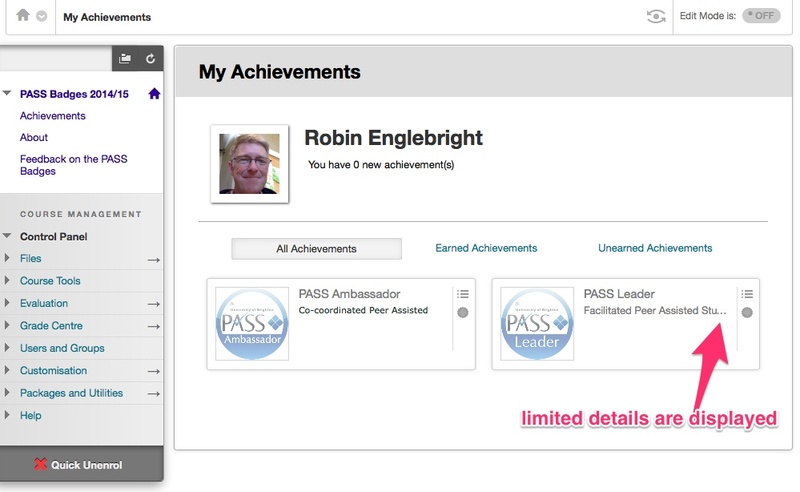 To test the Achievements tool we awarded badges to a completing cohort of PASS leaders and PASS Ambassadors. We set up a shell course and enrolled the users. 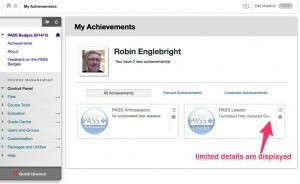 The Achievements tool requires a triggering event, which is linked to the grade centre, and takes a little finessing to render useful information back to the badge recipient. Some fields have limted characters, or only partially render depending on where the badge is viewed… In the my achievements area you get about 3 short words…. Deeper down you can get away with slightly longer descriptions, but the text is still limited. Sara did a sterling job refining the descriptions to around 20 words, which from trial and error we established was an effective limit. 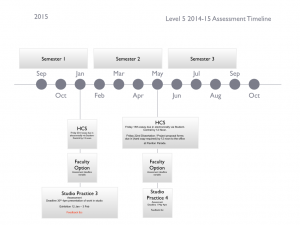 PASS Leader description: Facilitated Peer Assisted Study Sessions with first year students. This included lesson planning and leading sessions on discipline-specific knowledge skills. 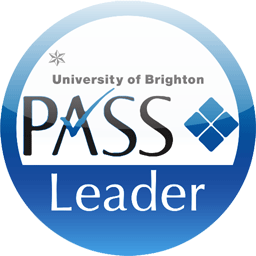 PASS Ambassador description: Co-coordinate Peer Assisted Study Sessions within their course. 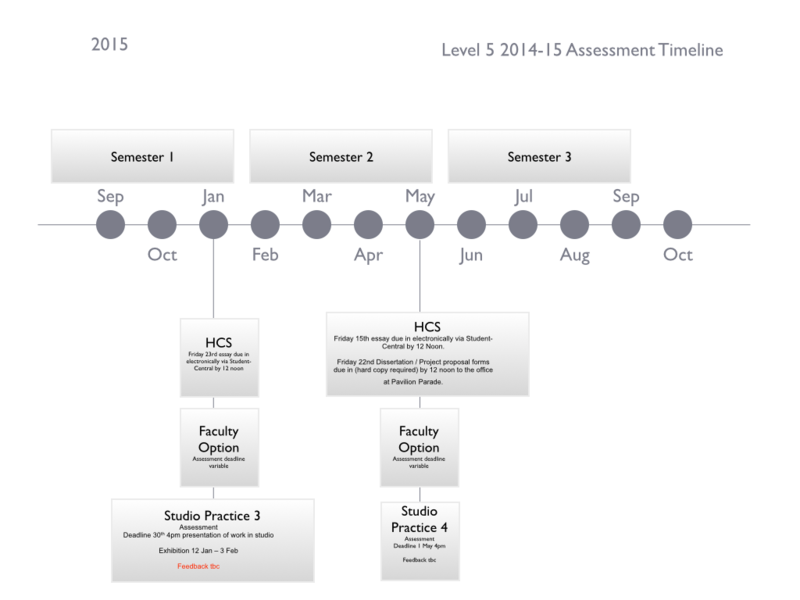 This involved liaising with academic supervisors, supporting leaders, and aiding in delivery. Another limitation is that however you provide the badge to Blackboard, it converts it to a 90×90 png, which tends to spoil the look of the badge, their compression algorithm gives the badges jagged edges, and I’d foolishly put too much detail in the badges, and used too delicate a font. The award of a badge produces a useful notification flash for the recipient when they log into the course area, and through Global Navigation notifications. However if the course area is a shell as in our testing, there is little to encourage users to visit the area, and this reason may make the use of the higher level Organisations as the awarding unit more effective. 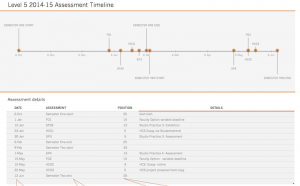 Whilst the process was instructive the result was slightly too high level for our immediate needs which were closer to a guidance doc for those planning to use it, to ensure they are aware of what they are doing. "Remote assertion must match local assertion". 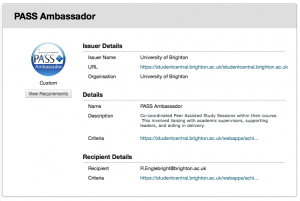 The experience of issuing badges in Blackboard was slightly disappointing, it offered a solution, but the snags and glitches proved to be deal breakers, particularly the need to bind the badge to a common email address, and the poor quality copy of the original badge graphic. We decided to maintain the Achievements tool for internal use, and investigate an alternative for surfacing badges in external locations. We discussed our findings with Anne Hole at the University of Sussex who use Open Badges as a way of accrediting staff CPD activity. Their solution was to use Credly which seemed to have several benefits for the end user, specifically that the badges can be surfaced in Linked-in profiles which aligns well with our employability strategy. 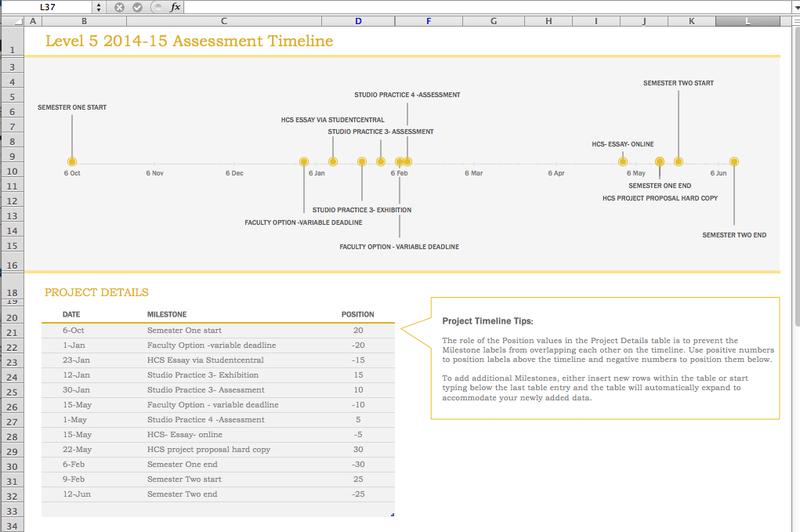 I’ve seen timeline tools being used to great effect in a number of situations , but unfortunately they are all a bit of a palaver to set up, and in some situations are just too darn interactive. 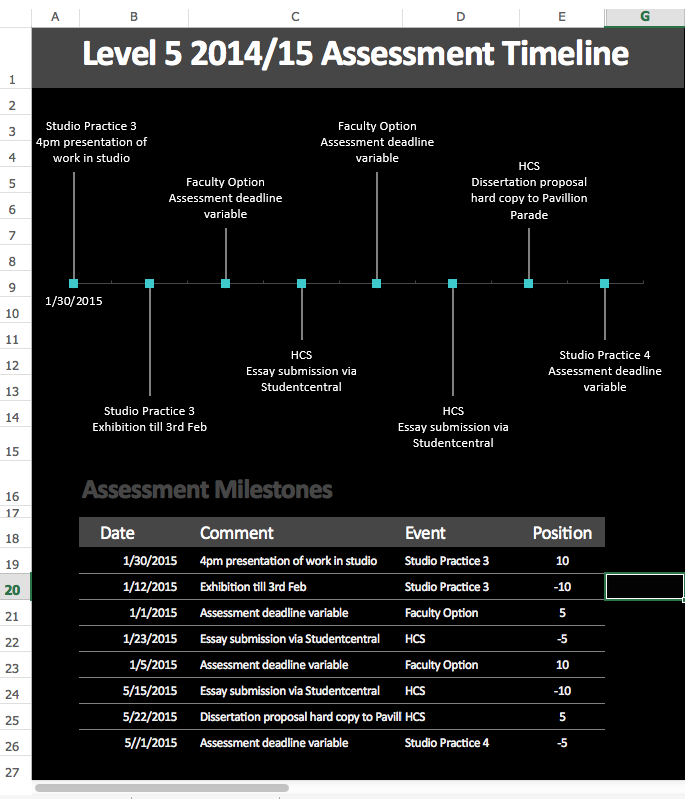 We’ve been discussing how best to view assessment timings down here at the city campus, both for students, so they have a clear overview to help them manage their time effectively, and for staff, who are mainly focused on a modular delivery, to help appreciate the bigger picture. 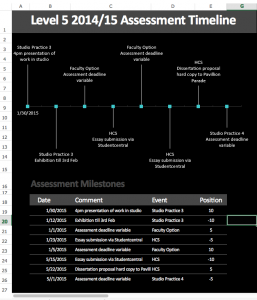 For simplicity I’ve decided to have a look at what sort of timelines can be created by staff on a mac using standard office software. The output is a visualisation of a table of data, so whilst it would be good if it produced accessible output, it may be better to create an time ordered plain text version of the data to support screen reader use. 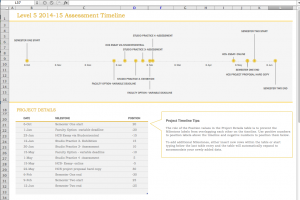 Microsoft offer some timeline templates which are fairly simple to use, but these are linked to Office365, and do require a Microsoft account for access. However there are plenty of other templates available. The one below was from tidy form. It generates the timeline from data in a small table, and includes a label height setting so long tags don’t run together. The output is a little more flexible, but doesn’t build the chart automatically. This sort of chart displays the span of a time period more effectively than the previous example, but they could equally be tweaked to produce similar output. Keynote is pretty fantastic tool for laying out elements in an appealing way. I’ve always found the guides which allow centralised alignment really useful, and of course the export options are pretty comprehensive. 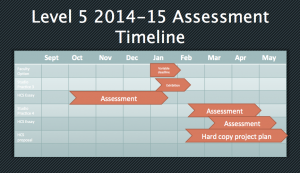 James Welch offers a keynote template which looks good, and is easy to edit. 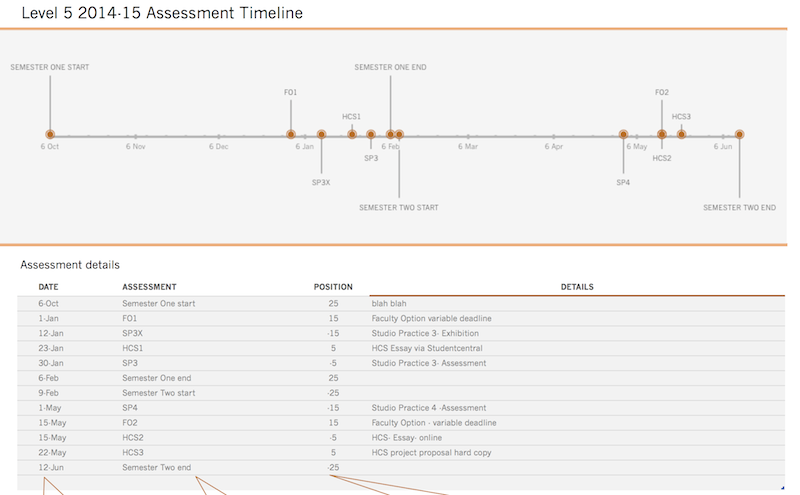 What becomes apparent in creating these timelines is that having a good set of data upon which to build is invaluable. 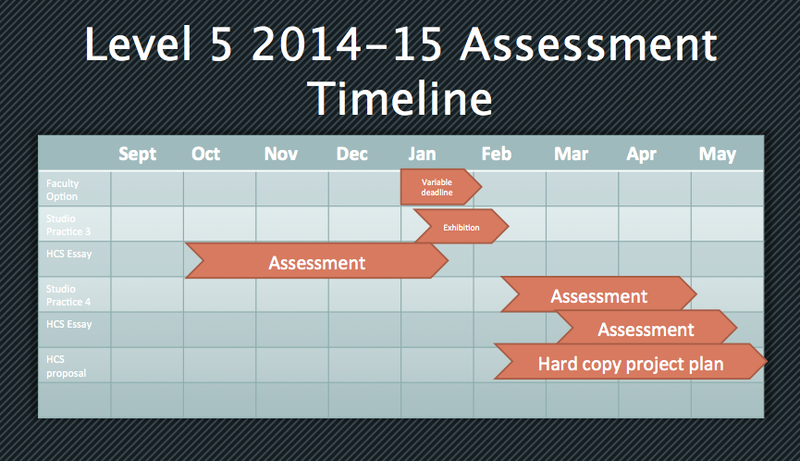 Next step is to have a look at whether the information presented this way is any more clear for students.